Islami Bank HSC Scholarship Circular 2017. Bangladesh Islami Bank HSC Scholarship Result 2017. 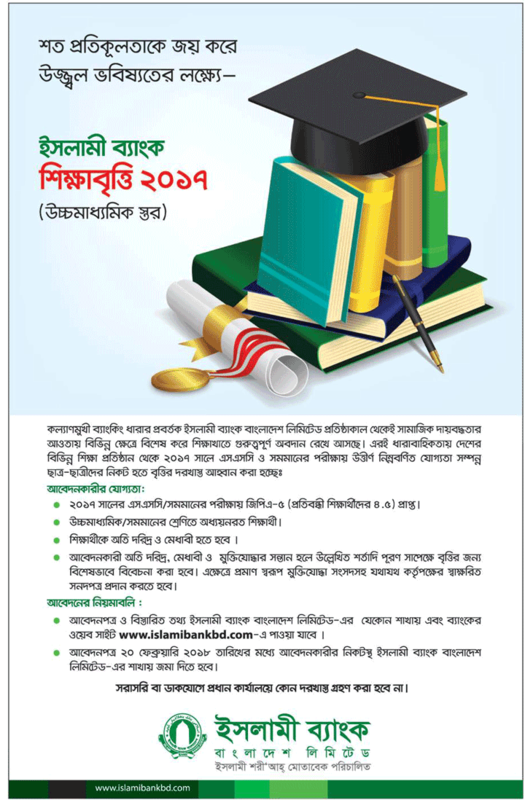 Download www.islamibankbd.com Scholarship Application Form from Online. When & How to Apply IBBL SSC Scholarship 2018. See Apply Instruction, Eligibility, Required Papers, Selection Procedures of Islami Bank Scholarship 2019. Through this post we will publish Result Date and Time. Get GPA-5 (4.5 students with disabilities) in the SSC / equivalent examination of the year 2017. Students studying in higher secondary / equivalent classes. Student must be from a disadvantaged and very poor family member. The applicant is very poor, meritorious and the child of the freedom fighter will specially considered for the scholarship with respect to the terms and conditions mentioned above. In this case, the certificates signed by the appropriate authorities, along with the Parliament of the freedom fighters, will required. Student Can Apply for Islami Bank Scholarship by Downloading the Application Form from Islami Bank Bangladesh Limited Official Website www.islamibankbd.com. After Download the Application Form from IBBL Official Website fill it up with Required Information and submit it your nearby any branch of Islami Bank. Application must be submit within 20 February 2018. There are no Application will be accepted by Postal Service or directly in Head office. Attested copy of the number sheet. 01 (one) copy (colorful) photo attested. Certificate of the signed study of the appropriate authorities of the educational institutions studying today. In ​​case of union council / municipality / ward councilor / employer, the parent / guardian / Regarding the profession of the guardian’s monthly income certificate. Attested copies of the father / mother’s freedom fighter certificates of the freedom fighter’s child. What is attested by the students of the disabled students? Students from any other bank or financial institution will not considered for the scholarship of Islami Bank. Information will considered as inefficient to receive secretariat scholarship. Incomplete applications are considered canceled. According to the applicant’s nearest Islami Bank Bangladesh Limited – 20 February, 2018. To submit to the branch. In this case, no application will accepted directly or by post at the head office. Any kind of recommendation will considered inadequate to receive scholarship. The Bank shall reserve the right to cancel or suspend any scholarship for reasonable reasons. After deadline, IBBL will publish result. When Result will published, we will update here. If you have any question about Islami Bank HSC Scholarship Circular 2017, please inform us on our Facebook Fan Page. If You get more update Everyday, Please like our Facebook Fan Page and get Updates.